I am writing on behalf of Clean Air in London (CAL) to respond to the Draft Westminster Air Quality Action Plan (Draft AQAP) Consultation. Thank you for the opportunity to do so. 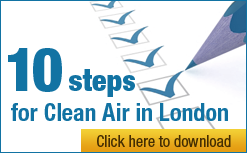 Information about CAL can be found on its website at cleanair.london. This response includes comments on the Strategic Environmental Assessment (SEA) for the AQAP. Clean Air in London’s (CAL’s) response focuses on the need to turn WCC’s vision and history of action into future measures that are in proportion to the scale of the air pollution challenge. Such measures need to protect public health, ensure full compliance with air quality laws and avoid European Union (EU) fines. ‘Pioneered the initial concept of a Low Emission Zone (LEZ) for London and promoted it, following commissioning of a technical appraisal in 1999’ (paragraph 6.1.7). possibility of infraction and fines for breaching the health based PM2.5 legal standards. You will be aware the Government is planning to take powers under its Localism agenda to pass EU fines to local Government which may seek to pass them on further e.g. to local businesses and residents. CAL is very concerned that WCC’s: vision; analysis of the sources of harmful emissions; and identification of the need to focus efforts on tackling emissions from transport (e.g. target pollution hot- spots and routes), are not yet backed by adequate transport measures. CAL is also concerned that the Draft AQAP does not include specific measures for 2012 to protect public health and comply fully with legal standards e.g. during the Queen’s Diamond Jubilee and the Olympic and Paralympic Games. CAL wants action now, not fines and excuses later. In CAL’s view, the only measure likely to meet all the above requirements is a robust new Clean Air Zone covering central and inner London. It should be combined with ambitious measures to increase walking and cycling. The SEA makes clear that ‘the main aim of the Westminster AQAP is to reduce the levels of NO2 and PM10 in Westminster to below the [National Objectives] in order to protect the health and wellbeing of the borough’ (paragraph 2.2 on page 12). Data shows that we are likely to exceed the levels required by the UK objectives at our Marylebone Road monitoring site (paragraph 8.3.5 on page 81). The NO2 hourly limit value is also likely to be breached still in 2015 without further action. WCC’s analysis predicts that road transport will be responsible for 67.2% of PM10 emissions (Figure 4 on page 30) and 43.0% of emissions of oxides of nitrogen (NOx) (Figure 5 on page 31) in 2015. It predicts further that contributions to: PM10 exhaust emissions from buses and coaches will be 11% and from taxis 45%; and NOx emissions from buses and coaches will be 47% and from taxis 11% (Figures 8 and 9 on page 37). The Draft AQAP then states ‘…it can be seen that buses and coaches are the most significant sources of NOx’ (paragraph 6.1.3). The SEA asserts ‘The assessment also directly addresses the likely changes to the environment without implementation of the draft Westminster AQAP which is a worsening of the city’s air quality and a related negative impact on the health and wellbeing of the city’s population, climate change and noise’ (paragraph 15 on page 7). CAL has found no quantitative evidence in either the Draft AQAP or the SEA to support this assertion. Please address this omission. You will be well aware that any or all the above legal breaches could lead to infraction action by the European Commission (Commission). Transport for London (TfL) has said ‘infraction proceedings against the Government could lead to significant fines, potentially in the region of £300m per year, for each pollutant’. You will be well aware that legislation proposed in the current Localism Bill would enable Government to pass such fines onto London. The European Commissioner for the Environment, Commissioner Potočnik, is on record as saying ‘the limit values or timetables are not negotiable’. WCC’s analysis makes clear there is no plan yet to comply with these requirements. CAL is pleased that the Draft AQAP correctly identifies the need to tackle emissions from road transport and target pollution hot-spots and routes (page 40). The Draft AQAP states ‘It should be noted that the City Council has only limited control over many of the main transport routes in Westminster as these roads form part of the Transport for London Road Network (TLRN) which is managed by Transport for London [TfL]’ (paragraph 6.1.2 on page 36). However, Table 3 on page 46 makes clear that WCC is the managing organisation for many key streets such as Oxford Street, Piccadilly and Regent Street. CAL wants the underlying air pollution problem in central London to be attacked by WCC in order to protect public health and ensure full compliance with air quality laws and avoid EU fines. exclude in a Phase 2 all pre-Euro 4/IV diesel vehicles (except Euro 3/III with a diesel particulate filter (DPF)) from the whole area of overlap between the borough and the Central Congestion Charging Zone by 30 September 2012. Ideally, this structure would be part of a similar approach, led by the Mayor of London, for the whole of central and inner London by 7 May 2012 and then reduced to cover the whole of the Central Congestion Charging Zone area by 30 September 2012. WCC should press ahead with these Phases in isolation if others will not act. CAL estimates that this would exclude up to: 13.5% of London Transport buses; 2.8% of taxis; and 26.2% of diesel cars in Phase 1. WCC should press for financial support for taxi drivers for Phase 2.
exclude all pre-Euro 6/VI diesel vehicles from the whole area of overlap between the borough and the Central Congestion Charging Zone by 1 January 2015. ‘The original central London congestion charging zone has been identified as a potential location for a local low emission zone due to the high concentrations of PM10 and NO2 in the area and because it is an established ‘zone’. TfL will work with boroughs and other stakeholders to assess the feasibility and cost effectiveness of potential options’ paragraph 3.12.4 on page 100). A Clean Air Zone is also consistent with comments made in the Draft AQAP. For example, the Draft AQAP makes the point that when ‘A feasibility study for a low emission zone was undertaken by consultants on behalf of [WCC] in 2000 [it] concluded that a London-wide low emission zone would bring background concentrations in most of Westminster to within national air quality objective standards, but would still leave exceedances at the kerbside and in parts of the West End’ (paragraph 6.2.1 on page 40). This conclusion is consistent with the German decision to implement inner LEZs in some 40 cities to ban the most polluting vehicles from the most polluted parts only of their cities (e.g. Berlin). However, please be in no doubt, given the scale of the public health and legal failings, CAL considers the three Phases should be implemented by the dates mentioned above whether or not the Government and/or the Mayor of London and/or Transport for London play their part in mitigating the impacts. Please will WCC champion action to tackle this problem. CAL is very supportive of WCC’s commitment to encourage walking and cycling. CAL is concerned though that there is no quantification or detailed analysis in either the Draft AQAP or the SEA of the extent, trends and benefits of walking and cycling as two of the most sustainable modes of transport. As you know, 5,500 cycle parking places in Westminster and the Mayor’s cycle hire scheme are no more than a drop in the ocean compared to what is needed. Please address this omission in the final AQAP. CAL notes your proposals to tackle emissions from buildings and development. Please amend the Draft AQAP throughout to take full account of the Mayor of London’s London Plan published today e.g. in respect of biomass boilers. consider cost-effective ways of minimising emissions from back-up generators. In CAL’s view, the ‘Evaluation criteria’ for the AQAP need to be more truly ‘output’ focused. For example, the number of air quality measures at hot-spots/hot-routes is not important per se; what is important is the reduction in annual mean and short-term concentrations of PM10 and NO2. Similarly, the length of new cycle routes installed and number of cycle stands is not important per se; what is important is the proportion of journeys by walking and cycling in Westminster. Please amend the Draft AQAP accordingly. In CAL’s view, WCC needs to match bold words with bold action in its AQAP. WCC’s own analysis makes clear that road transport emissions, and bus and taxi emissions in particular, must be reduced sharply in the most polluted parts of London if public health is to be protected, air quality laws are to be complied with and EU fines are to be avoided. In CAL’s view, the only proven measure that will achieve these objectives is a robust new Clean Air Zone in central and inner London. I have copied those investigating currently a Clean Air Zone for the Olympics.